There's nothing like visiting the mountainous region of Chiangmai, Thailand. The fresh air, the extremely gracious local people, and the rich Thai culture make our volunteer trips there something to look forward to. But what comes with the beauty of the countryside is the needy state of the schools. With low budgets and teachers that often have to take multiple jobs for a living, schools in rural Thai areas need all the help they can get. 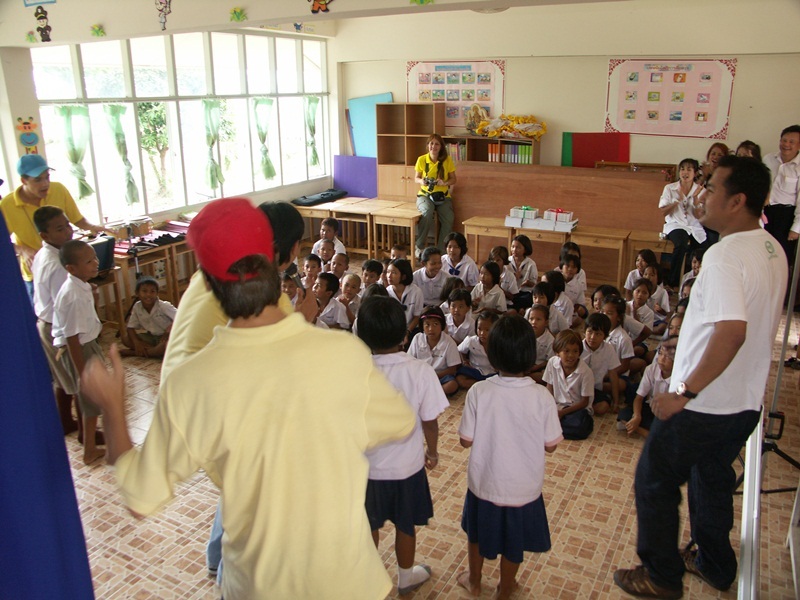 Our volunteer team has been visiting schools in Chiangmai for a number of years, bringing donated educational supplies, clothing, toys, setting up a computer lab in one school, and donating supplies to nurseries and libraries. The children are also exceptionally happy when they receive gifts personally, and during our visits we try to make gift packages for each child. The arrival of the donated materials from Activated Ministries coincided perfectly with our most recent trip to Chiangmai. 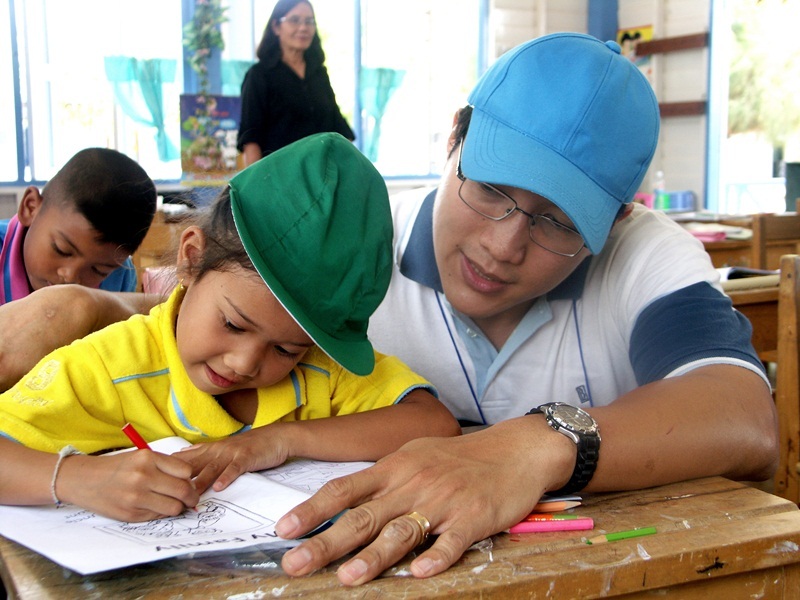 The Thai language Grandpa Jake storybooks and Grandpa Jake activity booklets were the perfect way to give each child a personal gift and give the teachers tools that they can easily use to teach good morals. We visited a very remote rural town called Wiang Hieng and we were able to work together with a very dedicated group of teachers and school administrators who attend to running two Thai schools, a Chinese language school, and a learning center at a refugee camp. They brought us to visit the children of the various schools and we distributed clothing, snacks, various donated books, the Treasure Attic VCD set, and the Grandpa Jake storybooks and activity books from Activated Ministries. We have found that first-time visits to schools are crucial, as oftentimes the children are shy and the teachers wonder if what you're offering is truly useful. After giving the teachers an explanation of how the books can be used as a fun and educational way to teach children good moral values, the teachers are very happy to assist our mission in any way they can. Giving each child his or her very own set of activity books also helps to break the ice and makes for great interaction. The teachers were very happy with what we had to offer and wanted to talk about ways that we could work together in the future. Working with teachers and students in Thai schools is always a pleasure. Being able to experience fun, laughter, and happiness with the children, and seeing the dedication of the teachers who put so much effort day in and day into helping their students have a bright future is always very inspiring. So when one of our friends invited us to organize an event for the children of a rural school in Pitsanulok province, we jumped at the opportunity. The occasion; the opening of a new school building. 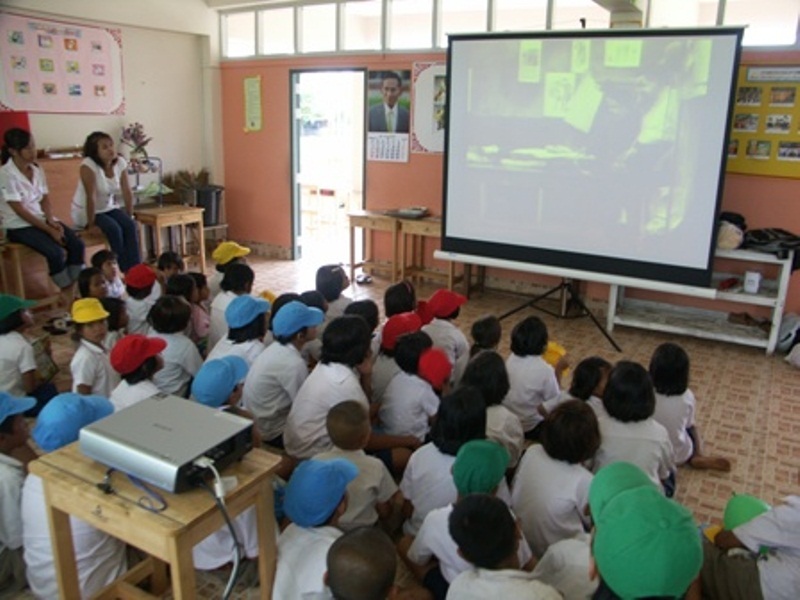 The activities planned; a full day of English learning, games, a magic show, puppet show, as well as the contribution of books for their new library. We were able to talk to the headmaster of the school. He was just a simple man who had always had a dream, the dream of the poor children of his neighborhood receiving free education. He has worked tirelessly to create a school, receiving donations from many in the surroundings areas and calling on a team working effort from the community for construction and resources. But because he was not able to collect as many contributions as he had hoped, the building was not of the quality he deemed needed. So he began writing to the government for a grant to make a new school building. Finally, after 10 years of asking, he was granted his request, and the event we were invited to participate in was the launch of this new school building. The happy atmosphere that day was very tangible, as everyone, both child and grown-up were ready to celebrate and have fun. The activities, games, and lively songs were all happily received, and when the end of the day came, the children didn't want to let us go. The headmaster made us promise to return again. All were especially excited when the Grandpa Jake storybooks were presented, and the headmaster thanked us repeatedly for the books (as well as other various educational books we provided for their library) emphasizing how much of a help they would be to the school. In working with numerous Thai schools and concerned educational professionals for many years throughout Thailand, we have observed over and over the desire for a program which gives students an opportunity to speak English and build confidence to learn. 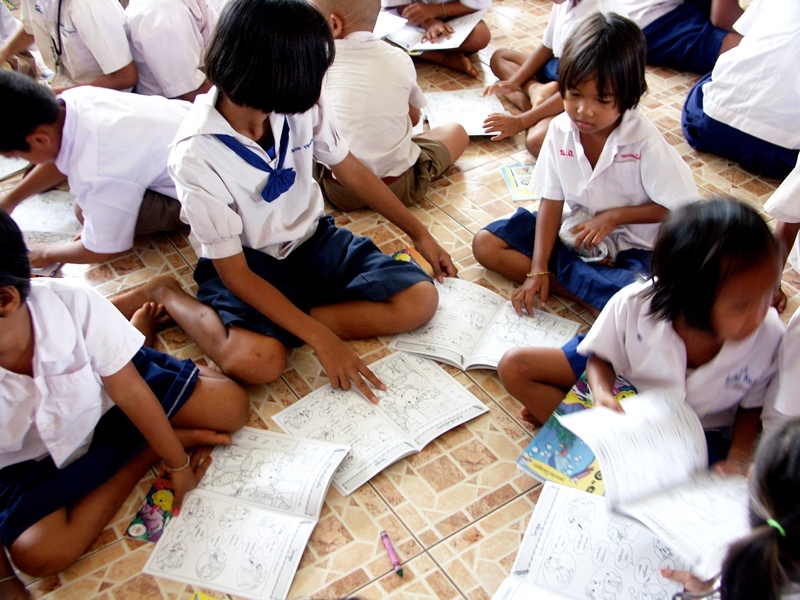 English can be difficult for Thai students, so what was needed was a program that inspires the students to learn, gives teachers the resources and methods to give their students incentive, and that makes English the fun learning experience it should be. Early on a sunny July morning, our volunteer team began the eight hour drive to Si Saket province where the teacher’s seminar would be hosted and where we would meet teachers from 10 schools. After a full month of finding sponsors and preparing a curriculum, this seminar would consist of five days of English camps at various locations, working with the teachers and students of those 10 schools. The teachers were very excited about the English camps that we arranged. The week passed by so fast! I guess time really does fly when you're having fun. Each camp involved a variety of learning activities mixed with music, games, art, audio-visuals, and rewards at the end that really helped make learning English a fun and memorable experience for the students. And this is not the end of the story. We will be revisiting these schools in the future to continue this program, picking the curriculum up where it left off. Khow yoi is south west of Bangkok, close to Thailand's border with Myanmar. Amongst the locals of this area are a lot of hill tribe residents. Two of the neediest local schools were blessed to receive sponsored books for the children. Between the two schools there are a total of around 200 children. These schools are not in the big city so therefore they don't have access to a lot of teaching materials. They also have a very limited budget for school supplies. The Grandpa Jake activity books made the children so excited as each child received his or her very own copy. We were also able to give the school a new selection of books for the library which will continue to be used regularly. Many of these children are the children of farmers and are therefore quite poor, so this opportunity which does not come so often has been a real encouragement to the teachers who also desire to give the best to their schools' children. The children surprised us by presenting a local Karen (hill tribe) dance to welcome our volunteer team. It was touching to see the effort and enthusiasm by all those involved. We were able to give 800 Grandpa Jake Books, and 20,080 Grandpa Jake Activity Books to all the different projects combined through the generous help of the Activated Ministries. We'd like to thank all those at Activated Ministries for how your contribution made these projects a huge success! The Grandpa Jake storybooks and activity books were a central part of the program that we could not have done without.